The problem of music, of course, is that it is, by its very nature, a public art. . . . Yet somehow there is something demeaning in the fact that there is no other dimension for music than this public one. When one begins to work—until that unlucky time when it is no longer involved with just a few friends, admirers, complainers—there is no separation between what you do and what you are. I don’t mean that you hope that what you are doing is real or right. That is not the question. You work. The work leads to a concept of music that draws attention. You soon find yourself in the world. Maybe not for the right reason—but you find yourself in the world. Yet there was that other “world”—of conversation—of anonymity—of seeing the paintings in the intimacy of the studio and not in a museum – of playing a new work on the piano in your home and not in the concert hall—of the hours spent walking, eating and talking with John Cage and not wondering if I should fly to Paris from London in order to spend a few hours with him in arrogant crowds of people. Nothing lasts. In Feldman’s retrospection, home and the studio, not the concert hall, proffered security. There he felt the unity of who he was and what he did—whether sitting at his piano, watching Philip Guston paint, or having lunch with Mark Rothko. Intimacy arose from his experience of art and music within the private sphere. It is ironic, then, that such intimate spaces were offered up for public consumption and became part of the general meaning of New York School modernism as the product of lonely men working in private. Hans Namuth’s photographs of Jackson Pollock are the most famous example circulating in the mass media. As Caroline A. Jones has argued, artist films—like Namuth’s of Pollock and Willem de Kooning, both soundtracked by Feldman—idealized the solipsistic creative vibrancy of studio spaces. Even Feldman’s home on the Lower East Side was offered up for prurient delectation in the middlebrow pages of Harper’s Baazar in1952. The “Bosa Mansion,” as Feldman and Cage christened it in honor of their landlord, was promoted as a far-out artists’ colony: “Fresh, seemingly capricious winds in music, sculpture and painting come from an ancient ramshackle structure . . . at 326 Monroe Street in New York, in the shadow of the Williamsburg Bridge. There, in a neighborhood of grime and garlic, four friends—experimental, even stratospheric artists—have established three uncluttered studios with a spectacular view of the East River.” Accompanied by a photo of Cage at his piano and another of Feldman, Cage, and two other friends—Richard Lippold and Ray Johnson—sitting in Lippold’s “de luxe hearse,” the Harper’s vignette grounds their off-center artistic practices in domestic spaces replete with the fresh air of American innovation. The “anonymous world” Feldman idealized was agonistically private and public, its primal scenes of creative spontaneity commodified in popular media. Using Feldman’s friendships within the New York School—with Guston, Cage, and Frank O’Hara—I explore in what follows tensions arising between intimate artistic production and its subsequent public circulation, and elucidate intimacy’s relationship to another affect of midcentury modernism—spontaneity. Whether achieved through “chance music,” à la Feldman and Cage, or “action painting,” in Harold Rosenberg’s formulation, spontaneity was, as Daniel Belgrad has argued, a cultural phenomenon at midcentury. I take Belgrad’s insights as axiomatic, but I am more keen than him to track the gradations of meaning that shade spontaneity as it circulates from the private space of the artist’s studio and musician’s home into the public sphere. Risks accompany this movement, and spontaneity’s heretofore unrecognized connection to intimacy is particularly audible in the music of New York School modernism. As a collective action produced by communities of varying degrees of familiarity, music dramatizes the ephemerality of spontaneity more than painting or poetry, the other arts I explore along with Feldman’s compositions. I track the simultaneous appearance of intimacy and spontaneity through three interrelated events in the life of New York School modernism: Cage’s promotion of Feldman’s graph music at the Eighth Street Artists Club, the premiere of Feldman’s orchestral graph piece Marginal Intersection, and the release of Feldman’s first LP record, with liner notes by O’Hara. Each event raises questions about the proper place for the production of spontaneity. Is it within the confines of a close-knit group of friends? Can it survive wider circulation and, in the case of Feldman’s LP, commodification? The issue is ultimately a political one that highlights a fundamental tension between spontaneity’s troubled relationship to both coterie and collective politics. For Feldman, spontaneity was lost the very moment it became a popular ideal. He instead argued for a music of intimate autonomy resistant to the political demands of spontaneity. This palpable feeling of foreclosure became the lodestone for Feldman’s post–1960 body of work, in which the improvisatory aspects of his music—especially the performer’s role in determining pitch content—were curtailed. Of Guston’s painting, Dore Ashton wrote: “spontaneity occurs in brief flourishes, the winging strokes that he sometimes places in the atmosphere to set it vibrating. Or it is read in the assurance of a single, broad sweep of the brush, overriding the strokes beneath it. In other words, spontaneity is used artfully as another element that can express multiplicity in experience.” Guston’s reminiscence recalls moments when spontaneous, “almost automatic” strokes no longer set things vibrating, and his overriding, destructive gestures failed to energize his creative practice. Only an encounter with his trusted friend restored him to a condition where action and spontaneity could again foster creativity. Despite the importance of Feldman, Cage, and other musicians to New York School modernism, there is no equivalent musical manifesto to Goodman’s and Schapiro’s calls for spontaneity animated by intimacy. This is likely the case for two reasons. First, Cage was the primary musical manifesto writer in the 1950s and his Zen-inflected vitalism—though shared with others at the Club, as Valerie Hellstein has noted—emphasized an anti-subjective, anti-expressive position. Cage, with his music of chance and (as it was known by 1958) “indeterminacy,” does not emphasize intersubjectivity as Schapiro and Goodman do. As Feldman’s primary spokesperson in the 1950s, Cage identified his younger friend’s music as a prime example of a non-relational spontaneity that accepted “whatever sounds come along.” But simply because Cage did not describe Feldman’s music in relational terms does not mean that it did not build communities. (What, after all, is musical performance if not the ephemeral establishment of community?) The second reason for the lack of a musical manifesto along these lines is that Feldman himself, given Cage’s boosterism, barely wrote at all about his music in the 1950s. What is remarkably consistent in Feldman’s writings post–1960 is his sustained lamentation over the loss of his community. A sense of thwarted intimacy suffuses these writings, lectures, and interviews. Taking my cue from Schapiro and Goodman, I argue here that Feldman’s music sheds special light on problems of intimacy, spontaneity, and publicity. I should, however, be clear that what emerges in my account of Feldman’s music in the 1950s is not an egalitarian model of inter-art collaboration. As Brenna Moore insists, “friendship is no safe haven from other kinds of power.” Substituting aesthetics for her focus on religious sensibilities, I follow her insight that “intimacy and friendship have their own specific religious power within these broader societal forces in ways that can never be fully disentangled” (439). Goodman himself noted that the continuation of community was no given and Feldman’s music often failed to forge an operable community in the eyes and ears of Cage as well as a broader public; even his deep friendship with Guston broke down in 1970 and never recovered. These private and public tensions shaped the varied meanings attributed to spontaneity in the 1950s and the ways in which Feldman’s music was often misunderstood or unrealized in performance and audition. Feldman’s spontaneity only conditionally overcame “the alienation of [his] art”—an overcoming he desired privately in the early 1950s. He did so most successfully only in the private sphere of trusted friends and collaborators including Guston, Rothko, O’Hara, and pianist-composer David Tudor. Feldman’s spontaneity does not allow access to a self-actualizing multitude, which Joel Nickels suggests is the power of modernist poets such as William Carlos Williams. Nor does it produce—as Hannah Arendt, an occasional lecturer at the Eighth Street Artists’ Club, theorized—a spontaneous “space of appearances” congenial to the working out of politics. Instead, Feldman idealizes a monadic intimacy that sidesteps the world to take refuge in friendship. This affectionate autonomy, Feldman concludes, is achieved only by reining in chance music’s performative spontaneity, of which, as Cage noted, he was the originator. Fig. 1. 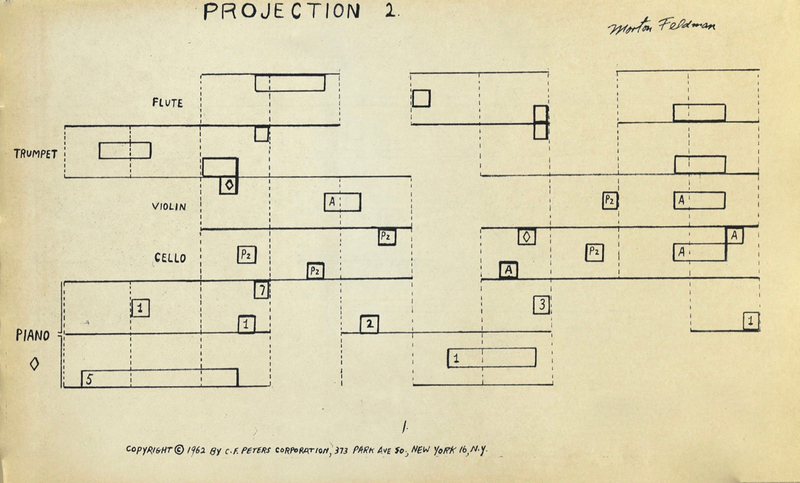 Morton Feldman, Projection 2 (1951), Copyright C. F. Peters Corporation, 1962. The title of this work refers to the projection of sounds into space. What particular sounds these are is left to the choice of the musicians at the moment of paying. The composer has indicated only timbre, register and time values. Since each performance of this composition is different, yet essentially the same, it will be played twice in succession. Here, in sharp contrast to his later statements, Feldman indicates that the performance of his graphic scores was meant to be realized “at the moment of playing” and not composed by performers in advance. This is the closest we come in Feldman’s own words to the “improvisatory collaboration” that O’Hara described as one of the virtues of the graph music. Spontaneity is here figured as decisions made in the flow of performance. That real-time music-making was expected as a performance practice is indicated by the decision to play the piece twice, so that the changes might be apparent. Yet Feldman’s insistence on the different performances’ essential sameness was founded in his interest in what he called “weight”—the particular combination and density of specific instrumental timbres at a given moment. Feldman expanded on this in a statement published in 1952, his only published commentary on his music of the 1950s: “Weight for me does not have its source in the manipulation of dynamics or tensions but rather resulting [sic] from a visual-aural response to sound as an image gone inward creating a general synthesis.” His elliptical elaboration, with its talk of responses and images, suggests that his version of spontaneity was inflected by the vitalism that he encountered among members of the Eighth Street Artists’ Club. Such metaphysical elaborations did not endear Feldman’s music to listeners. Early performances of Feldman’s graph music raised many questions about its appropriateness for public audiences and even its status as music. The composer-critic Arthur Berger was among the first to apply the term “chance” to this music, noting that Feldman “seems to have started the whole childish trend with his gimmick of indicating merely the note-lengths and ranges (high, low, medium) and allowing the players otherwise to choose any notes, within these broad limits, according to the caprice of the moment. The result was not even amusing.” Berger’s frustration with Feldman hinged on his view of graphic notation’s incorporation of spontaneity as a “gimmick.” As Sianne Ngai has argued, part of our frustration with gimmicks is their role as labor-saving devices. Gimmickry “irritates because it ‘abbreviates’ work and time.” Berger was annoyed because Feldman hadn’t done his job as a composer—the graph was an easy way out of the tough work of making music. The proper job of the composer is “filling out a time span with continuity and pauses within the continuity. … It all sounded like raw material of music not yet composed.” Berger, having come to hear “real music,” didn’t get his money’s worth. (Though, as a concluding jab, he recognized that “[a]ll this music was reminiscent of those paintings with a line or a blotch that we are supposed to marvel at”—an aesthetic connection indicative of the deeper personal ties between New York School modernists [Berger, “Music Notes”]). Naturally, Cage disagreed with these comments and at more than sixty years remove it is quite easy to side with him. But in Cage’s return to the controversy over Feldman’s music, the dilemma of the proper place for the production of spontaneity is opened up again. So too is the status of experimental music as a commodity form—its viability as art people will pay for. The critique of art economics and commodification is precisely Cage’s point. The “new world” opened up by Feldman’s music, succeeds,. in Cage’s view, in demolishing the distinctions between public and private, between art and life. Cage’s “Lecture on Something” was a dialogic exercise that echoed, developed, and put pressure on many of the ideas discussed at the Club. My reading of it here extends Hellstein’s insights into its sympathetic resonances with Abstract Expressionist discourse. I take “Lecture on Something” as not only evidence of a shared vitalist aesthetics common to Cage, Feldman, Rosenberg, and the painters, but also a gesture of friendship on Cage’s part offered to Feldman. Building on their intense creative exchange, Cage midwifed Feldman’s initiation into the Club and made his music intelligible to it. That is: starting finitely everything’s different but in going in it all becomes the same. H.C.E. Which is what Morton Feldman had in mind when he called the music he’s now writing Intersection. Feldman speaks of no sounds, and takes within broad limits the first ones that come along. He has changed the responsibility of the composer from making to accepting. To accept whatever comes re–gardless of the consequences is to be unafraid to be full of that love which comes from a sense of at–one–ness with whatever. (“Lecture on Something,” 129). The piece Cage mentions, Intersection, was Feldman’s first graph composition for full orchestra. Fig. 2. Morton Feldman, Intersection 1 (1951), Copyright C. F. Peters Corporation, 1962. Along with his comments on “weight” quoted above, this is among the earliest extant statements by Feldman that gives a sense of the metaphysics of his work. He desires direct experience, action, and attention to the present moment. That Cage was projecting onto Feldman is evident from his writings from 1961 on Robert Rauschenberg’s White Paintings (1951). The substitution of Rauschenberg’s White Paintings for Feldman’s Intersection proved to be an easy one; Cage identified in both a rejection of the dialectic of art and life. In both, the former collapsed into the latter. Cage describes the paintings as “airports for the lights, shadows, and particles.” They are open canvasses that accept intrusion—much like Cage’s reading of Feldman’s Intersection. Indeed, Cage had also brought up shadows in “Lecture on Something”: “I remember now that Feldman spoke of shadows. He said that the sounds were not sounds but shadows. They are obviously sounds; that’s why they are shadows. Every something is an echo of nothing. Life goes on very much like a piece by Morty Feldman” (131). And later: “The moment it becomes a special continuity of I am composing and nothing else should happen, then the rest of life is nothing but a series of interruptions, pleasant or catastrophic as the case may be. The truth, however, is that it is more like Feldman’s music—anything may happen and it all does go together. This is no rest of life. Life is one” (134). Cage’s appropriation of both Feldman’s music, and Rauschenberg’s paintings forged a genealogical link between them and his own 4′33″. Spontaneity for Cage and Rauschenberg is not, as with Feldman and Guston, the result of individual action or performer choice, but rather the acceptance of events beyond our control and beyond our ego’s desire. Cage delivered his “Lecture on Something” the week after Feldman’s own lecture “The Unframed Frame” was given on February 2, 1951. With Feldman’s text lost, it is difficult to know the extent to which Cage referenced Feldman’s ideas. The text of “Lecture on Something” went on to move the private debates of the Club into the public sphere. Beginning as a text for a specific semi-private world, it circulated in 1959 in Philip Pavia’s It Is (published to celebrate the release of Feldman’s first LP, on Columbia Records) and was later collected in Cage’s first book of collected writings, Silence (1961), where it is today best known. There, however, removed from its earlier abstract expressionist contexts, it is read through the other Cage texts and taken as evidence of a linear development towards indeterminacy. These shifting contexts track Feldman’s movement from private to public though Cage’s mediation, though Cage’s revisionist anti-Club sentiments risked garbling Feldman’s own desire to produce “a totally abstract sonic adventure.” Cage recognized the possibility of misinterpretation and included in both printed versions of “Lecture on Something” the disclaimer, “In the general moving around and talking that followed my Lecture on Something (ten years ago at the Club), somebody asked Morton Feldman whether he agreed with what I had said about him. He replied, ‘That’s not me; that’s John’” (128). Whether or not Feldman actually said this, it served to retrospectively distinguish Cage’s non-subjective aesthetics from Feldman’s faithfulness to abstract experience. In the months following “Lecture on Something,” Cage and Feldman quibbled over the meaning of the latter’s graph music. The composition and first performance of one of the orchestral graphs, Marginal Intersection, provides a counterpoint to Cage’s fantasies of radical acceptance. Fig. 3. Morton Feldman, Marginal Intersection (1951), Copyright C. F. Peter Corporation, 1962. I remember bringing in, for the first concert of Marginal Intersection at Cooper Union, plastic dishes and those old heavy aluminum pots and pans that I borrowed from my mother. My models for percussion at that time were from the Gamelan Orchestra, John Cage’s early forties pieces, and Varèse’s work, where the instruments were used en masse, not soloistically. I used that aspect as a model in Marginal Intersection, except I remember wanting the percussion to sound more like noise. I used “found objects” for sound sources. Of the oscillators, Feldman wrote in 1963 that the oscillators “cannot be heard, but are ‘felt’” as they are outside the range of human hearing. This was an early iteration of what Feldman would later describe as his desire to push sound to the “periphery . . . of human audibility.” Thus the titular emphasis on the “marginal” figured as the extreme of perception. Why should Marginal Intersection have proven to be such a challenge to Feldman compositionally and to Cage aesthetically? 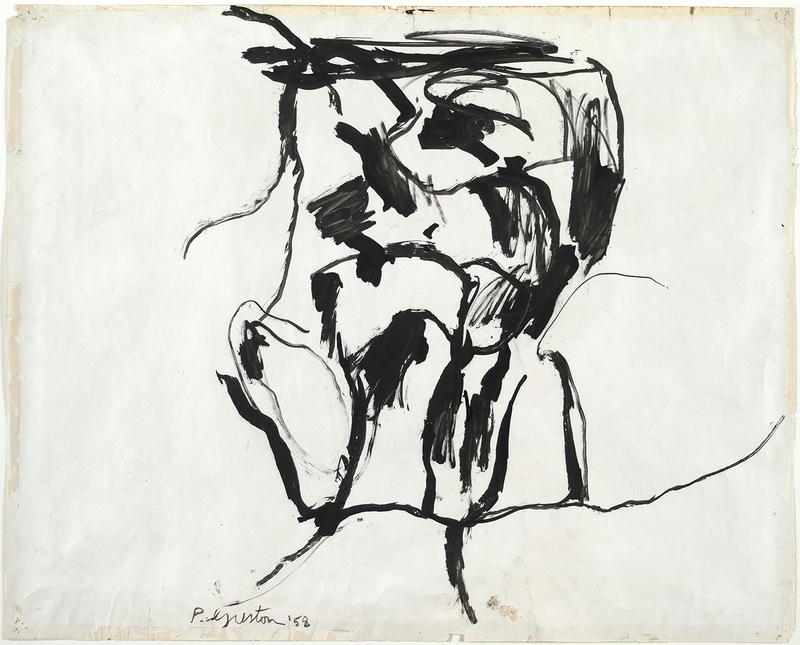 It is clear from Feldman’s sketchbook containing work for Marginal Intersection and his soundtrack music for Namuth’s Pollock film that his work fell off in the summer of 1951. After Marginal Intersection and Intersection 2, his next completed piece, Extension 1 for violin and piano, was not finished until November 12 of that year. With Extensions 1, his compositional fluency seemed to return and a series of works in conventional notation follows in the sketchbook: Extensions 3 & 4 and the open form piano solo, Intermission 6 (Sketchbook 3). Feldman’s working method for the graph pieces was to compose visually, directly on the grids. For large orchestral pieces, Feldman made individual parts for the players that were represented by notes placed on the top line, middle line, or bottom line of a 5-line staff. The rhythms, with their regular pulse, were written out in conventional notation, though the freedom to enter at any point within an indicated beat was explicitly granted to the performers. The sketches indicate a wider range of influences beyond those genres that Feldman later selectively remembered. Next to the percussion part, he wrote, “For desired effect: each player should think of this part[,] percussion part I: concentrate on wood and solo xyl[ophone] but when possible play other parts as in a jazz ensemble” (Sketchbook 3). Feldman’s comments refer to a style of performance more than any specific citation of jazz, though his exclusion of this influence from his later commentary is evidence of the erasure of jazz and its improvisatory spontaneity from the musical New York School. With evidence of Feldman’s diminished output between Marginal Intersection and Extensions 1, and no other surviving evidence for what this other Intersection might have been (certainly not Intersection 2, completed in July), just what Cage is referring to is unclear. The “present work” is likely Marginal Intersection. As noted above, the instrumentation included a phonograph, which the contemporaneous sketches and published score from 1962 indicate should play a sound-effects record of riveting. Cage’s early fascination with Marginal Intersection, though, centers on the paraperceptual use of oscillators—he makes no mention of the sound-effects recording. I might speculate that the recording of clarinetist and bandleader Artie Shaw may have stood in at some stage for the recording of riveting in Feldman’s conception, given the indication for the percussionists to perform “like a jazz ensemble.” Whether or not Cage’s comments refer to Marginal Intersection or to some other aborted Intersection, the evidence indicates that Feldman briefly attempted a rapprochement between his graph music and jazz—each with their invitations to spontaneous, real-time music making. Jazz, however, was what George Lewis has called an “epistemological other” for the composers of the New York School. Its form of modernism was largely excluded from their work—though a notable exception is a piece by Cage for magnetic tape collaged from spliced jazz recordings, composed a year after Feldman’s Marginal Intersection. Rebecca Kim argues that with this piece, Imaginary Landscape No. 5 (1952), Cage came to “an acceptance of jazz on its own terms through a willing suspension of distaste.” The Marginal Intersection controversy documents a step on the path to that eventual (and rather anemic) acceptance of jazz, predicated on Cage’s manipulation of it in recorded form. From the perspective of intersubjectivity and its relationship to aesthetics, Cage seems to recognize that a suspension of taste might be required as inoculation against the infection of friendship by artistic preference. The rupture of Cage and Feldman’s friendship over the issue of jazz (among others) indicates something else about the music’s ambivalent place within midcentury modernism—it was ignored as a viable accompaniment to Pollock’s filmic performance despite its actual role in accompanying the painter at work and shaping the sound world of the studio. It was subsequently blocked from intersecting with Feldman’s graph music, which Cage admired as long as it conformed to his idea of what it should be. Cage’s ambivalence about his friendship with Feldman, being “at sea,” reveals the pitfalls of art and life’s unification. As he had in “Lecture on Something,” Cage recognized the issue as one of acceptance. But whereas he there lauded Feldman’s ability to accept any sound that emerged in a performance, in the letter he faults himself for being unable to accept the sounds in Marginal Intersection. For as much as he criticizes Feldman, he critiques himself. We read him struggling to become the Cage we know today—to become as accepting as he found both Feldman and his music for Intersection 1. The archival record doesn’t offer a full picture of the resolution of this conflict, but it is clear from later correspondence between Feldman and Cage that their relationship was particularly rocky over the next few years. Cage struggled to subordinate aesthetics to the ethics of acceptance that he celebrated in “Lecture on Something” and that could have salvaged his friendship with Feldman. By erasing a distinction between “what one does and what was is” (as Feldman phrased it), Cage is not that different from his abstract expressionist colleagues and friends. Catherine Craft argues that, “[i]n their dealings with one another, artwork and creator would be heavily identified, and critical judgments could be based on morality as much as aesthetics.” Similarly, Cage understood Feldman the composer and Intersection 1 the piece as equivalent. The openness of the score’s grid functions as evidence of Feldman’s personal willingness to accept whatever sounds come along. But in the subsequent letter to Tudor we find an admission of failure. In a parrēsiatic gesture—borrowing Michel Foucault’s formulation—Cage “implicates himself in what he says,” so as to “strive to arrive at the [truth]”: the renunciation of hierarchies of taste. In so doing, however, he shows the risks such a collapse had for friendship, and the dangers of speaking for others about their work. At its premiere on November 7, 1952, Marginal Intersection had as sour a reception publicly as it had had privately with Cage. It was featured in a concert series titled “Music in the Making,” organized and conducted by David Broekman. Broekman framed the concert series as a critique of free market ideologies governing concert programs and argued that “[t]he trouble is the market is rigged, and there is price control of the worst kind. . . . There is simply no money to play American music and repeat a piece often enough so that it has a chance to become a classic.” Building up a concert repertoire of new American music was only part of the goal. The concerts were collaborative events in which performers, composers, and critics were put into dialog with one another, with the composers and conductor commenting on the works. Broekman hoped “that paying jobs for professional musicians may come out of this new audience-composer-critic participation formula for concerts” (11). S. Stephenson Smith, managing editor of the union magazine International Musician, was similarly optimistic about the series, saying that it “has shown that a new audience, predominantly trade-unionists, can be one and held for American serious music.” Here the progressive values of labor and community exemplify a different kind of spontaneity—the organization of a multitude resistant to the exploitation of capitalism (Nickels, Poetry of the Possible, 9–13). With its offering of spontaneous action and collective organization, Feldman’s music could have been an ideal way to organize a creative collaboration between performers resistant to the alienation of labor so strongly critiqued by members of the Club. Feldman’s acceptance, so lauded by Cage, is qualified by the need for discipline on the part of the performer. Parrēsia and askēsis were linked in the relational situation of Marginal Intersection. Feldman’s hope for this ascetic practice was that sound might be handled with “love and interest.” Marginal Intersection’s sounds, however, were not. did you give a kind thought, hurrying, to Alger Hiss? O’Hara’s verse confirms Feldman’s recollection that musicians often mistook the graph score’s openness as an invitation to do anything—undermining the piece by citing popular patriotic tunes, for example. Feldman recalled “Yankee Doodle” being interpolated in one performance. O’Hara documents in the stanza above that he heard John Philip Sousa’s “The Stars and Stripes Forever” march, with its web of patriotic associations. The nationalistic incursion into avant-garde performance exposes the risks of “giv[ing] a kind thought, hurrying,” to Alger Hiss, an accused (and convicted) Soviet spy. Politics and its dangers seeped into art and life. O’Hara’s recollection of Marginal Intersection insists too that friendship is nurtured by memory and place. The translation of Feldman’s music into “Poem Read at Joan Mitchell’s” attests to the work O’Hara’s coterie did to make a private claim on public space—as well as the tenuousness of that claim in the mid-1950s. Lytle Shaw notes in a different way than I do the “conflicted tonality” felt in O’Hara’s poem as it circles around the theme of heterosexual marriage, and the tonal shift towards celebratory intimacy when it addresses “the shared aspects of the interwoven lives of both absent friends . . . and those present at Joan Mitchell’s loft.” But even within that shift there remains in the stanza a thoroughgoing anxiety that haunts the shuttling between private friendship and the public sphere. The lesson Shaw draws out from O’Hara’s “poetics of coterie” is dramatized by Marginal Intersection’s performance, which thematizes the risks to art and friendship that come with the movement—as Feldman defined it—between studio and world. The anxiety over political blockage marks Feldman’s appearance in “Poem Read at Joan Mitchell’s” and recurs throughout documents of his friendship with O’Hara. Will Montgomery and I have both written on their friendship and the ways in which such feelings were registered. Montgomery notes compellingly that “while both artists occasionally subscribed to a vocabulary of liberating immediacy and freeing personal ‘expression’ in their writings both held back from the implications of ‘endlessness’ and acknowledged a form of containment.’” This containment is felt in the ambivalence of “Poem Read at Joan Mitchell’s,” which, like Cage’s “Lecture on Something,” began as a coterie text and was subsequently transformed into a published statement. O’Hara’s recognition of the limits on Feldman’s experimentation is tonally distinct from his statements in their private correspondence. There the poet is unequivocally enthusiastic about the radical possibilities of the composer’s work. Following a concert in late 1953 or the first days of 1954, O’Hara wrote to Feldman, “it was so exciting and inspiring to find one’s sensibility led into absolutely new experiences in such a subtle, authoritative way—without any posings or denial which only distract one when it’s a matter of real music.” Though O’Hara’s letters to Feldman are few, they are filled with similar endearments couched within invitations to intimate artistic collaboration. This optimism, however, is lost in O’Hara’s subtle critique of the affective occlusion felt in performance of Feldman’s music. O’Hara’s first published writing on Feldman was part of a triple collaboration on Feldman’s first LP, New Directions in Music 2 (1959). O’Hara wrote the sleeve notes, and the cover art was a drawing by Feldman’s close friend Guston titled Head—Double View. Fig. 4. Philip Guston, Head - Double View. 1958. Brush and ink on paper, 20 x 24 7/8." © The Museum of Modern Art/Licensed by SCALA / Art Resource, NY. © The Estate of Philip Guston. To perform Feldman’s graph pieces at all, the musician must reach the metaphysical place where each can occur, allying necessity with unpredictability. Where a virtuoso work places technical demands upon the performer, a Feldman piece seeks to engage his improvisatory collaboration, with its call on musical creativity as well as interpretative understanding. The performance on this record is proof of how beautifully this can all work out; yet, the performer could doubtless find other beauties in Intersection III on another occasion. (“New Directions in Music,” 213). Perhaps thinking back to the performance of Marginal Intersection documented in “Poem Read at Joan Mitchell’s,” O’Hara leaves open the possibility that the performance of Feldman’s graph music might also not work out so beautifully. Whereas Cage had focused on the askēsis modeled by Feldman’s acceptance of all sounds, O’Hara recognizes the ascetic demand Feldman makes of performers who must cultivate their own “metaphysical place.” It was a demand few performers—save Feldman’s close collaborators such as Tudor or Daniel Stern—heeded in the 1950s. Blue Poles is our Raft of the Medusa and our Embarkation for Cytherea in one. I say our, because it is the drama of an American conscience, lavish, bountiful, and rigid. It contains everything within itself, begging no quarter: a world of sentiment implied but denied; a map of sensual freedom, fenced; a careening licentiousness, guarded by eight totems native to its origins. (Jackson Pollock, 30–31). O’Hara’s interpretation of Blue Poles works along a spatial logic of outward expansion that is blocked by dominating forces. Fences and totems constrain the expression of sentiment and freedom. A logic of emotional occlusion is present here as it is in “Poem Read at Joan Mitchell’s,” where the vulgar nationalism of Sousa and red-baiting threaten the fragile cohesion of friendship. Shaw has argued that O’Hara’s interpretation is that “Pollock’s late works provide a drama of wild, affective energies undergoing a kind of neutralizing framing” (Frank O’Hara, 160). O’Hara identifies the same process as affecting Feldman’s music. O’Hara articulates the limits of Feldman’s askēsis in his discussion of Piece for Four Pianos (1957), which exemplifies another notational development beyond the graph scores and which required spontaneous interaction in a different way. O’Hara’s metaphors qualify the spontaneity of Feldman’s music that he had praised up to this point in his essay. O’Hara had used the metaphor of a restricted field as an image for his criticism of Pollock’s Blue Poles, which was “guarded by eight totems native to its origins.” In his critiques of both works, O’Hara evokes primitivist objects (totems and monoliths) that curtail spontaneous action. Noting these limitations, O’Hara identifies a darker truth about cultural production at the end of the 1950s: that the affective experience of Abstract Expressionism and chance music remained a risky endeavor, despite the expressive autonomy that brought the works into being. In O’Hara’s accounts of both Pollock and Feldman, aesthetic action offers the spontaneous overcoming of alienation. Still, these performances are stalked by ominous figures on the horizon. Piano Piece (to Philip Guston) (1963), as Feldman imagines it, is a relational object. The dedication is evidence of a continuing social life—one previously publicized through the mutual involvement of Guston, O’Hara, Tudor, and Feldman on New Directions in Music 2. Feldman reiterates the importance of personal knowledge—friendship—to artistic understanding and cites approvingly Tudor’s conformation to the composer’s idiosyncratic habits. The public performance of Feldman’s compositional comportment proceeded to make the spontaneous and private scene of composition available to the public through Tudor’s mediation. My account of questions about intimacy and spontaneity, publicity dramatized by Feldman’s friendships, requires us to shift the foundation upon which we base our discussions of his community as well as how we conceptualize the relationship between the arts at midcentury. Feldman’s laments for his community provide clear evidence that friendship in fact produced New York School modernism. Such friendships provided the “underlying network of awareness” that Robert Motherwell intuited among his peers (Craft, An Audience of Artists, 151). By recognizing these affective ties we have an answer to Motherwell’s question posed in the early 1950s: “what exactly constitutes the basis of our community?” Attention to Feldman’s relationships allows us to know the affective and epistemological conditions of friendship. His compounding and conflicting ties mark conflicts that reveal in sharp detail how friendship mediates aesthetic objects and leaves its traces on them. Poems, films, compositions, and recordings all register irresolvable conflicts between agapic friendship and agonistic authorship. Such tensions animated Feldman’s idealization of musical performance as a form of intimate autonomy. This idealization is ultimately political and provides an alternative to both the vulgar expressionistic model of the free-but-lonely painter and Cage’s non-relational idealism. It is, however, a melancholy heroism that has its limits—exemplified by Feldman’s attempts to reproduce as much as possible the space of home, even as the wider world continually intruded upon it. This article benefited greatly from comments from the anonymous reviewers and conversations with Mary Weismantel, J. Michelle Molina, Bryan Markovitz, Kyle Kaplan, and Inna Naroditskaya. Josh Rutner provided excellent editing help. They each have my thanks. Morton Feldman, “The Anxiety of Art,” in Give My Regards to Eighth Street: Collected Writings of Morton Feldman, ed. B. H. Friedman (Cambridge, MA: Exact Change, 2000), 21–32, 24. Amy Beal, “An Interview with Earle Brown,” Contemporary Music Review 26, no. 3 (2007): 341–46, 350. Morton Feldman, Letter to John Cage, March 29, 1966, John Cage Correspondence, Northwestern University Music Library. On Dominique de Menil’s aesthetics, see Pamela Smart, “Possession: Intimate Artifice at the Menil Collection,” Modernism/modernity 13, no. 1 (2006): 765­–85. Morton Feldman, “Four Lectures: N.Y. Style,” Morton Feldman Collection, Paul Sacher Foundation. Caroline A. Jones, Machine in the Studio (Chicago: University of Chicago Press, 1996), 72–80. “Four Artists in a ‘Mansion,’” Harper’s Bazaar, July 1952, 79. Daniel Belgrad, The Culture of Spontaneity: Improvisation and the Arts in Postwar America (Chicago: University of Chicago Press, 1998). Philip Guston, “On Morton Feldman,” in Collected Writings, Lectures, and Conversations, ed. Clark Coolidge (Berkeley: University of California Press, 2011), 76–79, 76. Dore Ashton, Philip Guston (New York: Grove Press, 1960), 53. Meyer Schapiro, “The Liberating Quality of Avant-Garde Art.” ArtNews 56, no. 4 (1957): 36­–42, 38. Morton Feldman, “After Modernism,” in Give My Regards, 67–79, 79. Paul Goodman, “Advance-Guard Writing: 1900–1950,” Kenyon Review 13, no. 3 (1951): 375–76, 375. Frank O’Hara, “Personism: A Manifesto,” in The Collected Poems of Frank O’Hara, ed. Donald Allen (Berkeley: University of California Press, 1995), 498–99, 499. On “New York Folk Art,” see Francesco Pellizzi, “Morton Feldman and the Arts: A Recollection,” in Vertical Thoughts: Morton Feldman and the Visual Arts, ed. Sean Kissane (Dublin: Irish Museum of Modern Art, 2010), 115 –123, 118. On “a new culture,” see Richard Bernas and Adrian Jack, “The Brink of Silence,” in Morton Feldman Says, ed. Chris Villars (London: Hyphen Press, 2006), 43–44, 44. Valerie Hellstein, “The Cage-iness of Abstract Expressionism,” American Art 28, no. 1 (2014): 56–77. Or as Benjamin Piekut has put it, “every musical performance is a performance of relationship” (Experimentalism Otherwise: The New York Avant-Garde and its Limits [Berkeley: University of California Press, 2011], 159). Brenna Moore, “Friendship and the Cultivation of Religious Sensibilities,” Journal of the American Academy of Religion 83, no. 2 (2015): 437–63, 439. “To the extent then that this advance-guard does not succeed in welding a community, secure enough to bear criticism and anxiety . . . the sanctions against it are absolute and terrible” Goodman, “Advance-Guard Writing,” 377. Morton Feldman, Sketchbook 3, Morton Feldman Collection, Basel, Switzerland. Joel Nickels, The Poetry of the Possible: Spontaneity, Modernism, and the Multitude (Minneapolis: University of Minnesota Press, 2012). Hannah Arendt, The Human Condition (Chicago: University of Chicago Press, 1998), 40. On Wolpe see Brigid Cohen, Stefan Wolpe and the Avant-Garde Diaspora (Cambridge: Cambridge University Press, 2012). Morton Feldman and Thomas Moore, “Morton Feldman In Conversation with Thomas Moore, 9 November 1983,” in Morton Feldman Says,,181–82, 181. Morton Feldman, “I Met Heine on the Rue Fürstenburg,” in Give My Regards, 112–121, 114. Morton Feldman, “Frank O’Hara: Lost Times and Future Hopes,” in Give My Regards, 103–108, 104. Martine Cadieu, “Morton Feldman—Waiting,” in Morton Feldman Says, 38–40, 39. John Cage, “Composition as Process,” in Silence (Middleton, CT: Wesleyan University Press, 1961), 18–56, 35. John Cage and Morton Feldman, “Radio Happening 1,” in Radio Happenings (Cologne: MusikTexte, 2015), 14–45, 20. Program for Merce Cunningham performance, Hunter College, January 21, 1951, Merce Cunningham Dance Company Archives. John Holzaepfel, “Painting by Numbers,” in The New York Schools of Music and Visual Art, ed. Stephen Johnson (New York: Routledge, 2002), 159–172. “Four Musicians at Work” Transformation 1, no. 3 (1952): 168–72, 168 and Henry Cowell, “Current Chronicle,” Musical Quarterly 38, no. 1 (1952): 132–43, 131. Arthur Berger, “Music Notes: Jeritza Back, ‘Dybbuk’ Off; Chance Games,” New York Herald Tribune, January 28, 1951. Sianne Ngai, “Theory of the Gimmick,” Critical Inquiry 43, no. 2 (2017): 466–505, 467. John Cage, “Lecture on Something,” in Silence, 128–45, 135. I have not kept Cage’s typographical arrangement. Andrea Caffi, “On Mythology,” Possibilities 1 (1947–1948): 87–92, 91. Harold Rosenberg, “The American Action Painters,” in The Tradition of the New (New York: McGraw Hill, 1959), 23–39. Caroline A. Jones, “Finishing School: John Cage and the Abstract Expressionist Ego,” Critical Inquiry 19, no. 4 (1993): 628–655. Mark Rothko, “The Romantics Were Prompted,” Possibilities 1 (1947–1948): 84. Reprinted in Mark Rothko, Writings on Art (New Haven, CT: Yale University Press, 2006), 58–59. David Cline, The Graph Music of Morton Feldman (Cambridge: Cambridge University Press, 2016), 243. Jackson Pollock, “My Painting,” Possibilities 1 (1947–1948): 79. Guston, “Interview with Jan Butterfield,” in Collected Writings, 290–97, 294. Cage, “On Robert Rauschenberg, Artist, and His Work,” in Silence, 98–108, 102. Branden W. Joseph, Random Order: Robert Rauschenberg and the Neo-Avant-Garde (Cambridge, MA: MIT, 2003), 49. Brett Boutwell, “Morton Feldman’s Graphic Notation: Projections and Trajectories,” Journal of the Society for American Music 6, no. 4 (2012): 457–82. Jan Williams, “An Interview with Morton Feldman,” Percussive Notes (1983): 4–14, reprinted in Morton Feldman Says, 151–52. Morton Feldman, “Marginal Intersection, Intersection II, Intermission IV,” Kulchur 3, no.11 (1963): 33–36, 33, reprinted in Give My Regards, 11. Michael Auping and Morton Feldman, “Touch,” in 30 Years: Interviews and Outtakes (Fort Worth, TX: Modern Art Museum of Fort Worth, 2007), 140–44, 143. John Cage, Letter to David Tudor, undated, David Tudor Papers, Getty Research Center, Box 52, folder 3. Transcribed in John Cage and David Tudor, Correspondence on Interpretation and Performance. Martin Iddon, ed. (Cambridge: Cambridge University Press, 2013), 13. Iddon estimates the date to be early June of 1951. Feldman, quoted in Frank O’Hara, liner notes to New Directions in Music 2, reprinted in Feldman, Give My Regards, 212. See Cline, Graph Music 149–50 and 300–305. Philip Pavia recalls Feldman saying that jazz was too instrumental and “not human” (Club Without Walls: Selections from the Journals of Philip Pavia, ed. Natalie Edgar [New York: Midmarch Arts Press, 2007], 61). George E. Lewis, “Improvisation After 1950, Afrological and Eurological Perspectives,” Black Music Research Journal 16, no. 1 (1996): 91–122, 103. Rebecca Y. Kim, “John Cage in Separate Togetherness with Jazz,” Contemporary Music Review 31, no. 1 (2012): 63–89. Jazz was not, however, excluded from the Club, and there were a few jazz nights on the calendar in the early 1950s along with performances of Cage and Feldman’s music. Other experimentalists—Edgard Varèse among them—pursued more lasting engagement with post-bop jazz in the later 1950s. See Olivia Mattis, “From Bebop to Poo-wip: Jazz Influences in Varèse’s Poème électronique,” in Edgard Varèse: Composer, Sound Sculptor, Visionary, ed. Felix Meyer and Heidy Zimmermann (Woodbridge, UK: Boydell and Brewer, 2006), 309–317. Brigid Cohen, "Enigmas of the Third Space: Mingus and Varèse at Greenwich House, 1957,” Journal of the American Musicological Society, forthcoming. Catherine Craft, An Audience of Artists: Dada, Neo-Dada, and the Emergence of Abstract Expressionism (Chicago: University of Chicago Press, 2012), 155. Michel Foucault, “Parrēsia,” trans. Graham Burchell, Critical Inquiry 41, no. 2 (2015): 219–53, 247. David Broekman, “Music in the Making May Make Jobs for Musicians,” International Musician (1953): 10–11, 10. S. Stephenson Smith, “Good Programs Mean Jobs,” International Musician, March 1953, 13. Lester Trimble, “Music,” The Nation, February 20, 1960, 175. Peggy Glanville-Hicks, “Music in the Making at Cooper Union,” International Musician, March, 1953, 13, 35. Robert Ashley and Morton Feldman, “Around Morton Feldman” 27, Morton Feldman Collection. Frank O’Hara, “Poem Read at Joan Mitchell’s,” Collected Poems of Frank O’Hara, ed. Donald Allen (Berkeley: University of California Press), 265–67, 265. Cf. Ashley and Feldman, “Around Morton Feldman,” 14. Lytle Shaw, Frank O’Hara: The Poetics of Coterie (Iowa City: University of Iowa Press, 2006), 53–54. Will Montgomery, “‘In Fatal Winds’: Frank O’Hara and Morton Feldman,” in Frank O’Hara Now, ed. Robert Hampson and Will Montgomery (Liverpool: Liverpool University Press, 2010), 195–210, 209. Frank O’Hara, “Poem Read at Joan Mitchell’s,” audit/poetry 4 (1964), 10. Frank O’Hara, Letter to Morton Feldman, January 2, 1954. Morton Feldman Collection. On their friendship see Ryan Dohoney, “Mourning Coterie: Morton Feldman’s Posthumous Collaborations with Frank O’Hara,” in New York School Collaborations: The Color of Vowels, ed. Mark Silverberg (New York: Palgrave, 2013), 183–97. Frank O’Hara, Jackson Pollock (New York: Braziller, 1959), 12. Clement Greenberg, “How Art Writing Earns Its Bad Name,” in The Collected Essays and Criticism, Volume 4: Modernism with a Vengeance, 1957–1969, ed. John O’Brian (Chicago: University of Chicago Press, 1995), 135–144. Albert Goldberg, “Record Reviews,” Los Angeles Times, September 18, 1960, F7. Robert Motherwell quoted in Robert Goodnough, ed., “Excerpts from Artists' Sessions at Studio 35, 1950” in Ellen G. Landau, ed., Reading Abstract Expressionism (New Haven, CT: Yale University Press, 2005), 159–164, 159. Ryan Dohoney is a musicologist and historian and writes on experimental music in the U.S. and Europe since World War II. He is currently completing a book on the religious affordances of experimental music in the 1960s and 1970s focused on Morton Feldman’s music for the Rothko Chapel. The present article is part of a larger project titled “For Morton Feldman: Friendship, Collaboration, and Mourning in the New York School.” He serves as Assistant Professor of Musicology in the Bienen School of Music at Northwestern University.